Even though they’re always my favourite thing at any big dinner, vegetables are one of the most difficult things to get right on Thanksgiving or Christmas Day, don’t you think? With fussy eaters and vegetable-haters spread out evenly amongst adults and children, it can be impossible to find festive vegetable recipes everyone loves…but not any more! 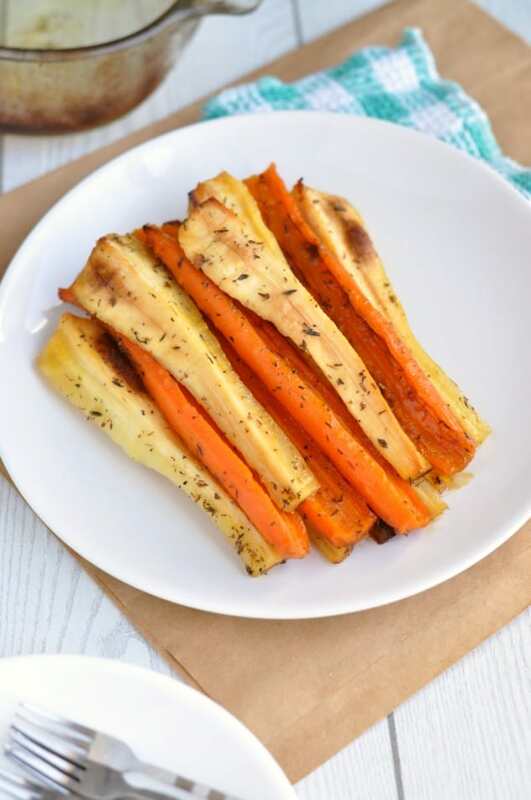 With this recipe for the most amazing honey roasted carrots and parsnips in your army, you’ll be able to stand back and watch as people go back for seconds, thirds and even fourths. Forget about roasted potatoes – these honey roasted carrots and parsnips will soon be everyone’s favourite winter side dish! I think the best recipes for Thanksgiving and Christmas are the ones that take minimal preparation and cooking fuss. And that’s exactly what these root veggies are about. Simply peel them, coat them with a basic oil-honey-herb mix and roast them in the oven until they’re caramelised and delicious. There’s no boiling, no chopping and no basting to worry about. Leaving you with plenty of extra time for things like open up a few extra Christmas presents (I’m crossing my fingers for Jamie Oliver’s 5-ingredient cookbook this year! ), actually tidy up some of the wrapping that’s all over the floor from the presents everyone else opened or enjoy a sweet Christmas cocktail. There’s one step in this recipe that might seem a bit weird to some cooks, but trust me on it. I don’t roast these veggies in a dry or even an oiled baking tin. 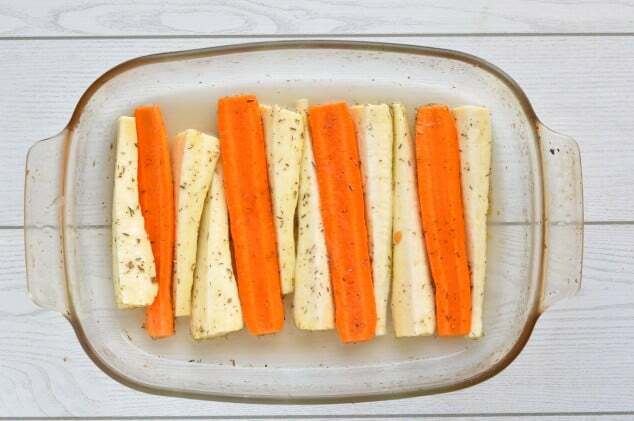 I pour a little water into a baking tray, add in the veggies and roast them in the water. You might think this would make the edges soft and prevent them from crisping up, but it doesn’t! It allows the veggies to steam while roasting at the same time, so the centres are soft and fluffy while the outsides are crisp and chewy. Sceptical that there’s no way something this delicious could be good for you? I honestly don’t blame you. But this is likely one of the healthiest side dishes you’ll make for your big feast this year! 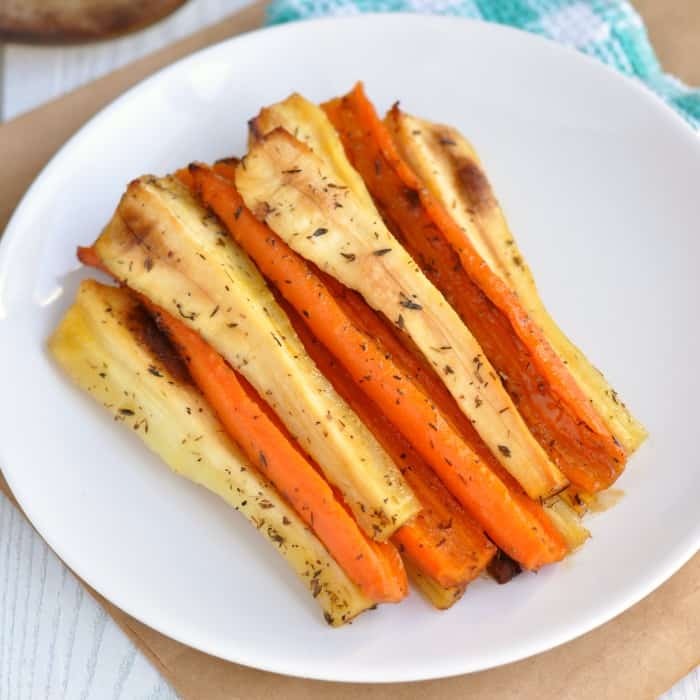 I use the smallest amounts possible of oil (which is olive oil – one of the healthiest cooking oils) and honey to create these amazing honey roasted carrots and parsnips. And anyway, if you can’t indulge on Thanksgiving or Christmas, when can you? Tender and sweet winter root vegetables coated with the most amazing (and simple!) honey glaze, all roasted in the oven until the outsides just start to turn brown and caramelise. Preheat the oven to 400F/200C and pour the water into a large baking tray. Set to one side. Peel the carrots and parsnips. Chop the ends off and slice vertically into halves or quarters, depending on how fat your veggies are. The idea is to get them all roughly the same thickness. Place into a large bowl. Drizzle the veggies with the honey, olive oil, thyme and salt then toss to coat. 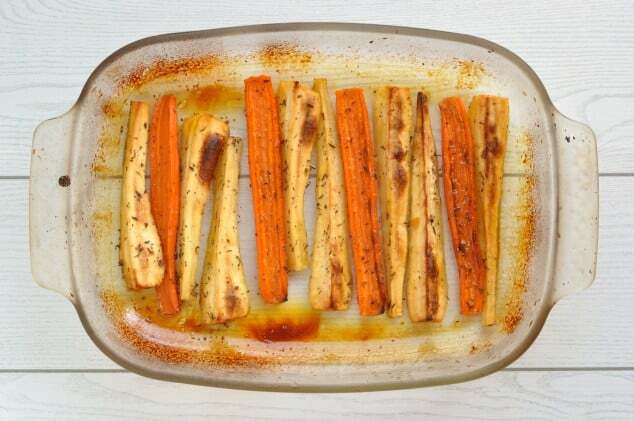 Lie the carrots and parsnips in a single layer in the water on the baking tray and roast in the preheated oven for around 50 minutes, until the edges have crisped up and are starting to turn brown. Wow, I’m not a carrot fan but this sounds REALLY yummy! Pinned! Definitely will have to try soon! I’m not a big fan of cooked carrots but those look very tempting. I’m opening Sweet and Savoury Sundays early this week to make up for missing last weeks, so be sure to stop by and link up at the earlier time of Saturday 8am UK time. Happy New Year! I seriously love carrots and I also adore parsnips (though I don’t eat them nearly enough) and this recipe looks amazing! I would eat the whole pan! Yum! Thanks so much Kathryn! I struggle not to devour the whole pan as soon as I pull them out of the oven every time! Thanks so much for the pin and I hope you enjoy them as much as we do! Hi Nicole. So happy you’re using one of my recipes for your Christmas Day menu! Nope – no baking rack required here. I cooked my carrots and parsnips directly on the black tray that you can see in the pictures. By pouring water into the tray that you’re cooking the vegetables in, the water helps steam them and stop them drying out. Thanks so much, Nicola!! 🙂 🙂 Merry Christmas!! I love how easy to prep these carrots and they look amazing!!! Thanks so much, Ludmilla. They really are easy! Yum! I love roasted veggies! This sounds so simple and easy, perfect for a tasty side dish! These look absolutely perfect! Adding them to my Thanksgiving menu! For some reason, carrots and honey just go together. Your preparation of them looks soooo yum! My family and I are definitely parsnip lovers so I know we will love this recipe! I really like the addition of the thyme for depth of flavour. What a great holiday (or any day!) side. I absolutely love roasted root veggies and these look amazing! Love the idea of adding a honey glaze! Thanks so much, Sarah! The honey really does make them taste so much better. These look gorgeous! Perfect Thanksgiving side dish. The glaze on these vegetables is just so pretty in your pictures. Totally agree with you there, Krystallia! Can these be frozen then re-roasted? agree with everything exept that carrots and parsnips lie in the pan. They’re veggies, they lay.. And I also hope I don’t miss the oil!! I love that this recipe is so easy and simple, but also absolutely delicious! This is the perfect side dish for entertaining. Love the recipe ! This can easily become a favorite with my family ! I tried these out during that week between Christmas and New Year and they were simply fabu! Thanks so much! These do indeed look amazing. 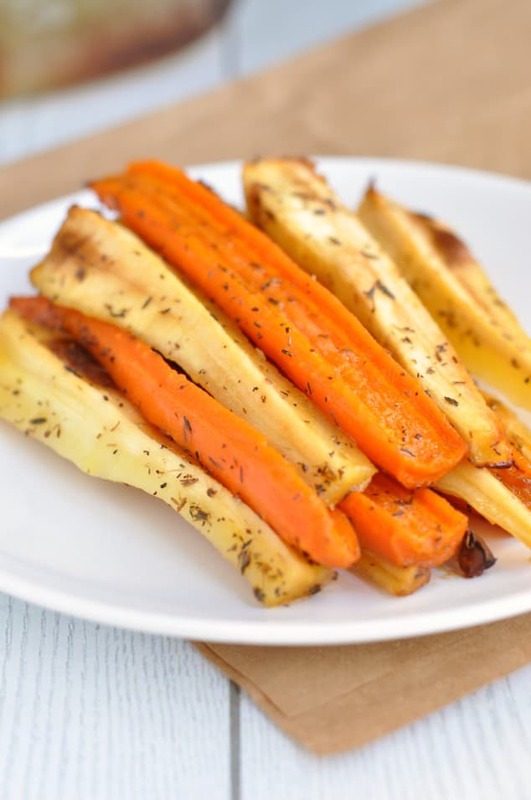 I never think about roasting parsnips along with carrots – now I’ll have to try them! Thanks so much, Jill. Roasting them together saves a lot of time, space and makes them taste amazing! 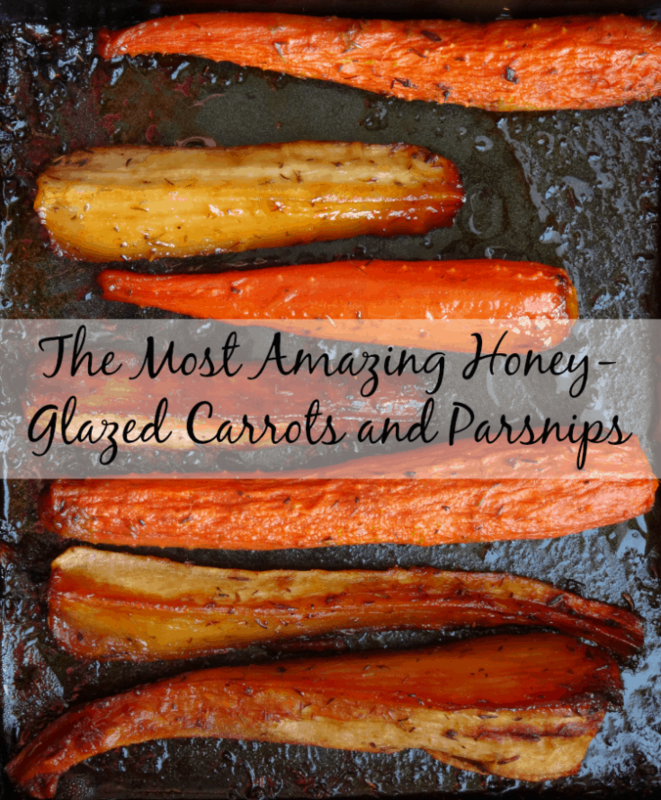 I totally agree with you there – I love cooking carrots with honey! Vegetables are my family’s favorite part of the holiday meals we enjoy together. But I bet these would make them even more excited for side dishes. These look amazing!